The Patrons' Show last night was a success for most of our crew. We had about 13 people that we knew sitting together at the Torpedo Factory. Nate and Besse got their #1 and #3 overall choices selected as their two tickets got called before the first break. I had to wait until about 15 picks from the 2nd break to hear my name. 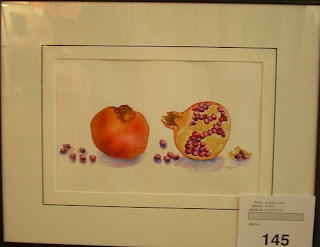 Fortunately after more than 300 pieces of art had been selected, our #1 pick (pictured above) was still available! Believe it or not, the picture of the man and the cow (featured in my previous post) was selected a few picks into the 2nd segment and well before I made my selection. When it comes to art there truly are a wide range of personal tastes. My Dad's entry was the only entry amongst the 13 people there that lasted until the 3rd segment. Apparently he got his 15th choice though so all is not lost. Before the show I went with Nate/Besse to a local sports bar to catch the start of the Daytona 500. I kept tabs on the race during the auction using my phone. Kyle Busch (Josh's favorite driver) and Denny Hamlin (my favorite driver) were running 1-2 for much of the race. Unfortunately, Dale Earnhardt Jr decided to battle with another car even though he was a lap down and cause a large multi-car wreck that ended the night for both Busch and Hamlin. Nate capped off a great night as his driver, #17 Matt Kenseth held on to win the rain-shortened race. Thankfully this is only race one of a long NASCAR season and I'm hoping the #11 car bounces back in California this weekend.